A workplace induction is a process that ensures new workers receive accurate and consistent information on how to perform work tasks safely. An induction should always be performed before workers or contractors perform any work tasks in your workplace. This form is used to record the information of workers that have undergone WHS Induction. 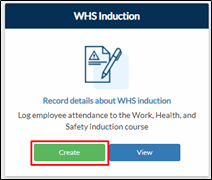 Project Page – Click Risk Management tab > Create on WHS Induction tile. Search Bar – Type Induction Form then click the result. Navigation Bar – Go to Risk Management > Induction Form. 2. Select a project name. Note that the Project Name field will only appear if you created it outside your project. Project Address will also be filled out once there is a selected project. 3. Fill out the fields, then sign the respective fields to certify the information given. 4. Tick the checkbox that confirms the submission of the worker's white card and the provision of information. 5. Draw the Site Supervisor’s Signature. This serves as a verification of the information on the form. 6. Click Submit. Note that this prompt appears when you forgot to tick the check box above the signature of the site manager.